These modular prefabricated dome top double opening bus shelters are ideal for providing shelter for waiting passengers to encourage the use of bus stops, shuttle depots, railway stations and other similar locations. Made of aluminum, and available in several different sizes with the choice of an Austin White or Quaker Bronze finish, each bus shelter is structurally framed in with built-in lean rails. The panels are made of 3/16" clear tempered safety glass, highly resistant to breakage, scratching, salt and other destructive elements. Available with or without an ADA compliant aluminum bench with backrest. Use as passenger waiting shelters and provide shelter from rain, wind and snow. Use as outdoor smoking shelters with exhaust fan and provide a smoke-free workplace. 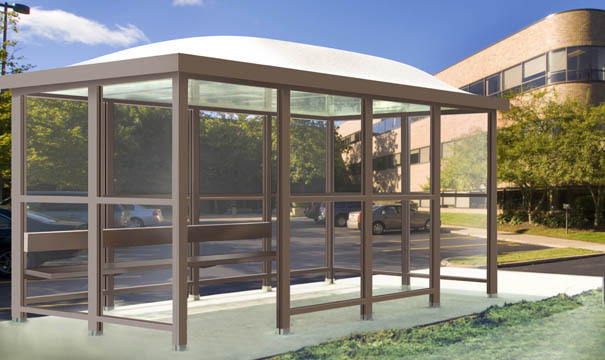 * 15'L Bus Shelters use Double Dome Tops.